Padrons are some of the finest cigars available, at any price. They are Nicaraguan puros that are carefully aged, perfectly constructed, beautiful to behold and full of complex and delicious flavors. They sell well enough at full price that you don’t see great sales on them very often. Expect to pay at least $20 each for them at a cigar shop, and not much less on-line. The other day a dealer let me know they were having a sale on them, but it was one of those sales that only runs for a few hours and I didn’t have time to tell you about it in the newsletter. So I went searching for other places for sales . . . and didn’t find much. Most sites were offering 10-25% off – no big deal. 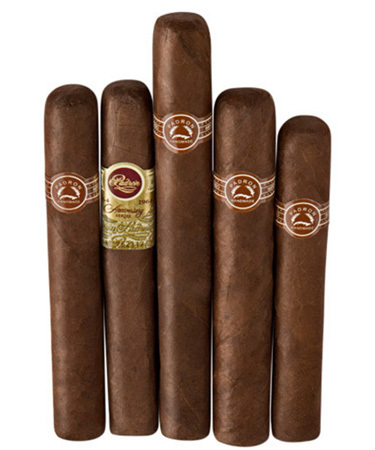 But…I did find one great deal – The Padron No.88 Maduro Collection, a five pack containing a variety of their maduros for half off the regular price. They still aren’t cheap, but this is the best deal you’re going to find on them.